New! Three new sizes with inputs up to 2245 MBH for expanded application range. 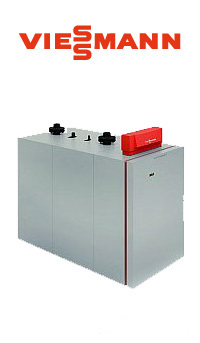 Up to four Vitocrossal 200, CM2 boilers can operate in a cascade configuration (inputs of 133 to 8980 MBH). Multiple venting possibilities with installed air intake kit for direct or chimney venting PP(s) or stainless steel up to 200 ft. of vent length. Generous heat transfer surface area/heat input ratio of stainless steel heat exchanger maximizes heat extraction in compact size. New! Vitotronic control features large display with text and graphics for straightforward, menu-driven programming and operation; cascadable with external control option. Available fully assembled (U.S. only) or unassembled for maximum shipping and installation flexibility.